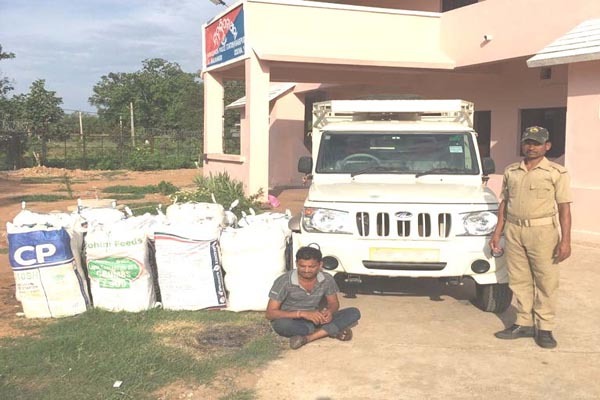 Malkangiri: The Mudulipada police has nabbed a 32-year-old man on charges of illegally transporting ganja and seized 477.450 kg ganja from a pick-up van on State Highway-47 near Podaghat chowk in Malkangiri district on June 18 night. The accused was identified as Ranjit Kumar Garnaik of Purunagada village under Chendipada police station limits in Angul district. According to the police, last night when Mudulipada police was on a routine patrolling and checking duty it noticed a pick-up van moving from Balimela side to Govindpalli area at a high speed at around 10.45 pm. Suspecting something foul, the police chased and intercepted the vehicle. As soon as the vehicle was stopped, the driver and the accused abandoned the vehicle and tried to flee. However, on duty police personnel managed to nab Ranjit while the driver fled away from the spot taking advantage of the darkness. As many as 16 numbers of polythene bags were found stashed with ganja during a search operation conducted by the police. The police registered a case under NDPS Act and arrested the accused.